BlueHost is one of the industry leading company which offers best web hosting for small and medium business websites. Just go with them without any doubt and start your online journey today. Before I start to explain the BlueHost review, Let’s take a quick overview of the company. BlueHost is one of the oldest and famous WordPress hosting company founded in 2003 by Matt Heaton. With hosting more than 2 million domains and an estimated amount of 15,000 to 20,000 new customers every month, they are growing day-by-day. In 2010, Endurance International Group acquired it. The company has more than 700 employees. BlueHost offers a broad range of features like unlimited web space, unlimited transfer, MySQL, PHP, Perl, SSH, Free site builder and much more. No doubt that they offer the quality services at the very affordable price. If we go through the list of the top 20 largest web hosting companies, It is one of them. In 2009, BlueHost introduced a new feature to all of its customers called CPU Throttling which is also known as dynamic frequency scaling. CPU Throttling: it is a process to reduce the CPU usage so that to prevent the processor getting overheated and damaged. In short, it is resource optimization method. However, regarding Hosting, it is a bit different process. When there is a too much user at one time on a shared server means that when too much use of CPU resources simultaneously, the CPU will freeze your account CPU usage. At this particular time, your website will extremely slow down and will only be released when the hosting company staff thinks; it is the right time. So far, according to my information, BlueHost and Hostmonster implementing the CPU throttling. They implemented this feature due to the massive database quarries because they use too many resources and so that other people face the problems. BlueHost Review 2019 – Is It the Best Web Hosting for WordPress? Customer support service is considering the backbone of any online or offline business. An excellent customer support service creates the loyalty and goodwill of the company among its clients. From my experience, I will give 9.0/10 to their support. The customer support team is well trained, friendly and 24/7 approachable. In the case of any problem major to minor you can contact them by a variety of means like by sending the support ticket, over the phone, live chat or join the BlueHost community. 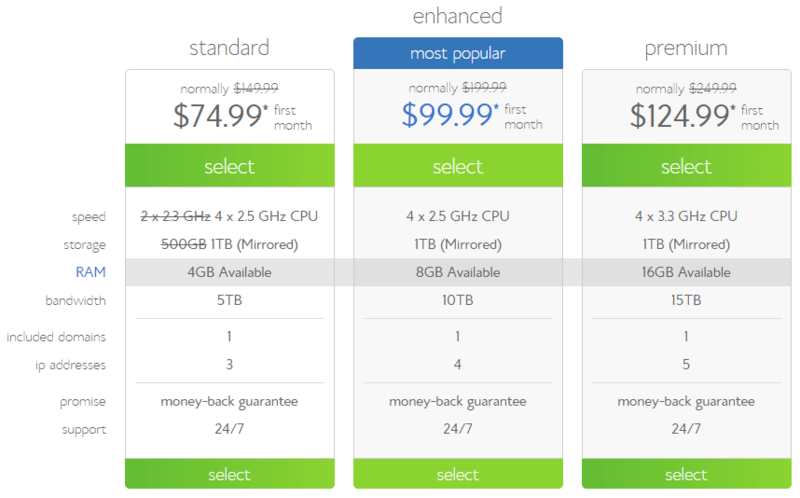 The hosting storage space limited to 50 GB SSD for starter plans. But their Plus/Pro plans offer unlimited web space and bandwidth. As I contact their live chat, they said, their starter plans can easily handle 25k visitors per day. So, if you are a starter or medium business then shared hosting starter plans are best for you. If you’re looking for more speed, performance, and control on your web server, then VPS and Dedicated hosting servers are perfect for you. In my experience, BlueHost servers are quite fast and load your site within 2~3 seconds. In short, you will get 50 GB SSD web space, unmetered bandwidth, 25 sub-domains, 100 email accounts, and 5 parked domains, at the price of $3.95/month. Isn’t it make sense to choose their services? Let’s say that you purchase a cheap hosting but its control panel is difficult to understand then you’ll need to invest significant time to understand the panel. The time that you should use for building your actual website, now you wasted it in familiarizing the cPanel. The cPanel of BlueHost is very easy to manage and administer. You can install different types of scripts like WordPress, Joomla, phpBB and many others very easily. You can create email IDs related to your domain name. There are many more features in Cpanel like creating and managing the database, emails forwarding, FTP public account, etc. Ultimately I can say on the basis of my experience that the panel is very user friendly. It is an important feature of BlueHost. Usually, users while purchasing the web hosting check everything but neglect the backup service. So I recommend users just go through the backup policy before buying any hosting service. So here BlueHost got another plus point. It automatically creates the backups on the daily, weekly and monthly basis of your entire account and you can restore it with few clicks. BlueHost also offers Pro Backup service. In case, you are running a small website then you don’t need to use it. Otherwise having a bigger website you should go for Pro Backup to make your site risk free. Security is an important aspect when you are working over the internet. Lack of security protocols can be very harmful as the hackers attack your website, or there can be some other problems that will infect your site due to lack of security. So you need to be careful. BlueHost offers secure servers even for their shared hosting users. The company updates the security protocols on a routine basis. They offer different ways to ensure that your website is secure by providing SiteLock site scanning. BlueHost offering different hosting plans like Starter, Plus, Business Pro (for the shared hosting) and five different levels of hosting services such as Shared, Cloud, VPS, WordPress Managed and Dedicated Hosting. Now let’s talk about the hosting plans and prices. Their hosting packages are affordable and the price they demand is reasonable. You can get some exclusive discounts from my provided link to get your desired hosting plan and free domain name at the lowest price. BlueHost Plus hosting plan is the most popular packages and has more features than the first one as it supports unlimited websites and storage. Want to get maximum control on your hosting server or having high traffic site? Then you can buy BlueHost’s VPS server hosting plan. Take a look at their VPS hosting plans. Dedicated hosting built for business or sites having millions of page views and visitors per month. With dedicated hosting, you can install any script on your web server. Here is BlueHost Dedicated hosting packages details. When you search the reviews about the BH, you find many positive and negative thing about the company. As you know that nobody is perfect so this is also applicable to BlueHost. I described the features and Pros of BlueHost above. Here are some Cons you should consider before going for bluehost Hosting. I have found some key points that everyone should consider before buying hosting from BH. And I think you must read. The renewal prices are higher than the first time purchasing because they offer the highest discount for the new customers. Not only BlueHost, very well-known hosting companies such as A2 Hosting and Hostgator also provide such kind of discounts for the first time purchase to attract more clients. Actually, in simple words, we can say it is the norm in the hosting industry. You can get a big discount and save huge money by purchasing hosting plans for an extended period such as 2~3 years. And at the time of renewal, signup for a new account so with this approach, you will again get a significant discount. However, BlueHost’s renewal rates are competitive, and anyone can easily afford it. As I describe above about the CPU throttling, your website will slow down when a high amount of users at a time surfs your site. If you are running a small website then, no need to worry but in the case of a massive amount of traffic it may be a problem. This issue could be overcome by shifting to another plan that can handle more user at a time. I contact with BH support to confirm how many visitors shared hosting can handle per day, and they said their shared hosting could easily handle 25K visits a day. Many hosting companies do it for free such as HostGator, WPEngine but BlueHost demands a fee of $149.99 for site migration. It could be a problem when you haven’t possessed enough technical skills, but I can help you migrate your wordpress site from one web host to another freely. I have personally used BlueHost to host MyTipsHub. Their Cpanel is very simple and easy to use, even newbies can easily understand it. You can activate CloudFlare within the Cpanel. Create sub-domains and email accounts within a minute. So, Is it recommended to use BlueHost? Of course. I highly recommend it. Moreover, their 1-click installers help the new and intermediate website owners to manage the site easily. The live technical support is proactive and connects with you within a few minutes (usually 1~5 minutes). I hope this Bluehost review will help you know thing’s that are essential before buying hosting from them. I would highly recommend BlueHost Hosting for one looking for good server speed, uptime, affordable price, and live chat support. Still, have any doubt and confusion? Feel free to ask in the comments section below.